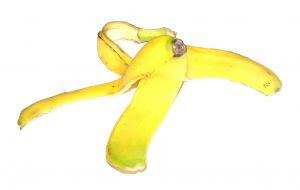 In the days of slapstick comedy, the banana peel provided more than its share of laughs. Of course, in real life it could bring about a painful injury. I've discovered the banana peel has a positive side. Instead of chucking it in the trash, I now put it in my compost pile. Next year, when I start my garden, I'll have nutrient-rich dirt in which to plant my veggies. Recently, I went on a cleaning spree. It became a necessity since I could no longer see my desk. I'm now contemplating clearing another area of the office. In a comment to my Blogging Buddy, Rita Gerlach, at InSpire, I told her I'd planned to discard some of the older versions of my manuscripts. Her post made me re-think that course of action. That old "banana peel manuscript" could provide some important benefits to my current and future writing endeavors. Our progress as writers is often slow and not always noticeable to us. Looking back at an old version can show us how far we've advanced in our writing techniques and thereby encourage us. Not all of our past writing is trash worthy. Some of it didn't move the story along, but contained some good fodder for another project. What are the ways you recycle words that end up on the editing room floor? I admit to shredding some old writing. After hanging on to it for years, revising, editing...I still find it not good enough to continue with. Don't put your banana peel in the compost and don't throw out old drafts. Bananas are imported and the peels are heavily sprayed. Composting them puts all that poison in your wonderful compost. BTW...I've heard that applying banana peels to warts will make them go away. Good point! I save a good part of what I write, for I never know when a snippet or two can be recycled into another article or story idea. You're so organized! I have a file from each book in the same computer folder, and dump all the rejected stuff in there. Argh - there goes my analogy and my compost! I didn't know banana peels weren't good for compost. I almost got rid of the entire first draft of The Moses Conspiracy. Who knows? Maybe someday I can give an example of a first draft paragraph and a final draft of a paragraph. Maybe I should have asked, "have you ever used anything you saved?" LOL! You're all so good about keeping your work. Rita's post brought me up short. I know I would have needed a tidbit as soon as the trash collectors pulled away from the curb. Hmmm. I've cut and pasted them and now I'm deleting files bursting with "What is this?" "Why did I save this?" files. Luckly most of my old stuff is on a USB memory device, so I don't have paper hanging around so it's easy to store. I did recently throw out all my old journals that I thought I would one day use for writing. Instead of feeling a loss, I felt lighter. I think our hearts know what writig needs to be discarded and what we should save. I still have heartfelt, full of teenage angs poetry I wrote 30 years ago! http://www.jameswatkins.com/bananas.htm. Also, I reviewed the book on my blog here: http://emilyakin.com/writing-with-banana-peels-by-jim-watkins/. I've gotten rid of some of my old projects in the past--but most I hold onto in case I want to polish them in the future. I was actually reading through a manuscript I wrote a few years back and even though it was pretty recent, I could still see how much I've grown as a writer. There were a lot of passive verbs and adverbs, of course, but there were a few interesting phrases or tags I'd love to use in a current project. Oh yes I agree, don't throw away your old manuscripts. When I re-read old stuff, there is certainly a lot of groaning going on, but there is also moments of "a ha!" or "I need to find a new home for this description"
I'm glad you've found uses for saved bits and pieces. All of you are inspiring me to revisit the older versions of my manuscript. Perhaps we need to look at the things we've saved with a critical eye. I probably could chuck the first 10 pages of my old manuscript and never look back. The action began on Page 11. LOL! Funny, I was thinking about my old journals. I need to go through them. Unfortunately, it's like putting a gazillion pictures into albums - time consuming. I'm familiar with Jim Watkins' book, but I rarely review non-fiction titles. Also, my book review/author interview day is Wednesday. At least you don't have tons of paper. My writing is stored both on my computer and hard copy. I still have hard copies of early versions of Book 1. I save old cuts in a file, but rarely use them. Sometimes I re-write a banana peel piece and turn it into an apricot. I'm glad you're having fun with your garden, Susan! I do several rewrites, so when I moved, I got rid of all but the last rewrite for each book. One thing I did keep was the first handwritten text (with a map) of my first novel. I thought it might be protection in case someome thought I borrowed their ideas. My finished manuscript is pretry old by now, but it is still my favorite. Your comment inspired another post. Thank you! LOL! My garden yields more than veggies. Blog posts are cropping out of the ground too. It's hard to know what you should keep and what you should throw out. One commenter saves her old stuff to a flash drive. It's a way to save things without drowning in paper. I recently shredded a part of the contents of a three ring binder. My husband probably thinks I am a 'hoarder' because I have pleaded with him not to have me toss old stuff. Every once in a while, I go through my old journals, notebooks, and binders as I look for topics on which to blog. I save and save things, and then go on a cleaning spree. At Rita's urging, I'm thinking before chucking anything out. Great! I'm so glad you find gems among your notebooks and other documents. I wondered how many people actually re-purposed old manuscripts/articles. The other day, I pulled out an article I'd written for a particular publication. Unfortunately, even though it was accepted, they went out of production. I'm trying to figure out a way to use this article. We'll see. I have a cut document with each of my books, but I don't always copy stuff into it. Only the major deletes get copied and pasted into the Cut file. I've blogged for over four years, and much of what I've written between '06 - '08 I've deleted from my blog. At first I saw those years as a waste of time, but I realized that I was finding my voice in God. Everything we write serves a purpose. Thanks for this post and reminder! Wow! You're a veteran blogger. Do you regret deleting so much of your blog content? I've been backing up my blog to my hard drive, and then backing everything onto a thumbnail drive. Maybe I can use some of my posts in the future.